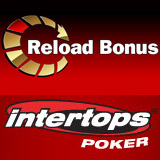 It's Reload Bonus time at Intertops Poker again this weekend. From October 5th – 8th (only), the fifteen-year-old poker site will double players’ deposits up to $300. Players taking advantage of this offer will also be invited to play in a special freeroll tournament early next month. To claim your reload bonus, players just enter the reload code “oct12” after you make a deposit. Bonuses will be immediately tagged to your account. Prague Main Event 2012 satellites will also kick off this coming weekend guaranteeing at least one $2,700 prize package. Satellites will run until November 18th. Serving players around the world since the early days of the internet, Intertops is one of the most trusted online poker room, casino and sportsbook sites. Known for its friendly customer service and hassle-free deposits and withdrawals, Intertops gives away tens of thousands of dollars in bonuses every month. Complete details of Intertops Poker’s $500 Reload Bonus and Oktoberfest Challenge are available at http://poker.intertops.eu/en/promotions/.